Do you have any leftover wool?…why not knit for the neonatal unit at Royal Free and Barnet Hospital special care babies! 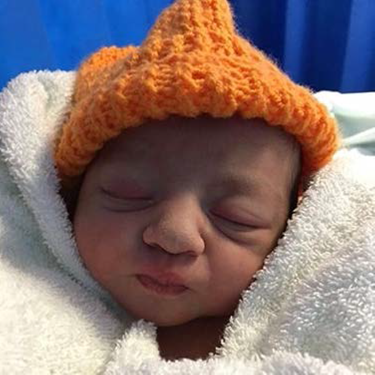 The orange hat helps the team easily identify which babies need extra care, allowing them to take timely observations, blood sugar tests and provide extra support to establish feeding so that mothers and babies can stay together. If you or anyone you know loves knitting and has some spare time and orange wool handy, please support this worthy cause by knitting hats for us as we get through over 150 hats every month. Volunteer knitters continue to meet every Tuesday outside the PALs office from 11am-1pm. Please join them whatever your knitting skill level is – they will be happy to teach you to cast on! The neonatal unit at UCH is also always appreciative of knitted items to keep their premature babies warm. They would particularly welcome hats of any colour. Please also think about approaching your local NICU unit to find out what knitted or crocheted items they are looking for, from simple 5″ bonding squares to more complex patterns – every hand crafted item is treasured.